I left Zelenkovac sharing a ride with Gareth, David, Thibault and Maria in Gareth's model 1966 VW Beetle, which we started calling as the Buba. It was a small challenge to pack in five people and all the luggage including three tents, but eventually we managed to make it even quite comfortable. Gareth had put the Buba together using parts from several different cars without adding a new layer of paint so the old machine looked like it could fall apart any time. Watching locals' reactions was fun. People would wave happily with a broad smile on their face or just stare at us. David would wave back from the left front seat with both hands, which produced an additional shock as many thought he was taking hands off the steering wheel. The Buba was a British model so the driver was of course sitting on the right. The police stopped us several times to see car papers. They complained about not seeing the license plate because it was under the spare tire we had tied with rope in the back. We fixed the problem by making a new plate using a piece of cardboard and attaching it on top of the tire. Recently expired green card was a slightly bigger problem. David's Serbian language skills saved us three times, but finally at the border they wouldn't let us through without corruption money or being stuck for long time waiting to pay a fine. Generally also the police was mostly amused of the whole sight of five people in the small car. One of them looked at us while browsing the papers and commented: "Oh, it looks like you have already enough problems with the heat :)"
We drove to Visoko near Sarajevo, where a couple of hills had recently been identified as possible ancient pyramids. For a non-archaeologist it was difficult to say from a few patches of stone wall exposed from vegetation. To be fair, we only visited the so called Sun pyramid, and some people said there would have been a bit more to see at the Moon pyramid. Three of us had already been to Sarajevo so we decided to skip the city and continued South-East to Montenegro instead. The Buba carried us through the beautiful canyon of the Piva river and further up the mountains to the Durmitor national park. For accommodation we always simply looked for empty fields where grass had been cut and set up our tents, asking locals for permission if we saw anybody nearby. Shortly after Durmitor we left the car in Bijelo Polje near Serbian border because we wanted to go to Guča and insurance for Serbia would have been too expensive. Gareth, Thibault and Maria took the train, I hitchhiked with David. We won the race by one and a half hours and made a new friend with Slobodan, a Serbian van driver on his way back home to Belgrade. Guča trumpet festival was a funny experience. Dozens of brass bands came to play in the small town of 2000 inhabitants which was completely taken over by half a million partying visitors. Five days of music and dancing powered by beer, rakia, grilled meat and more beer. Souvenir stands were offering small horns, cds, other Guča memorabilia and Serbian nationalistic T-shirts featuring pictures of Karadzic. I had less beer preferring instead to cook vegetarian food and sip sangria with a group of three Germans, two Italians and a Swedish girl who were camping next to my tent. Friday and Saturday evenings featured the biggest concerts on the stadium, but I liked Thursday night best. On Thursday the bands were on the streets playing simultaneously over each other with bars blasting Serbian turbofolk from loudspeakers to the mix, creating a chaotic but happy atmosphere. There were already many people but still a bit more space to move than during the weekend. Overall, Guča was certainly worth seeing even for someone who is not specially a brass music fan, but perhaps it was enough to experience it only once. Guča was the last place where out group of five friends was together. 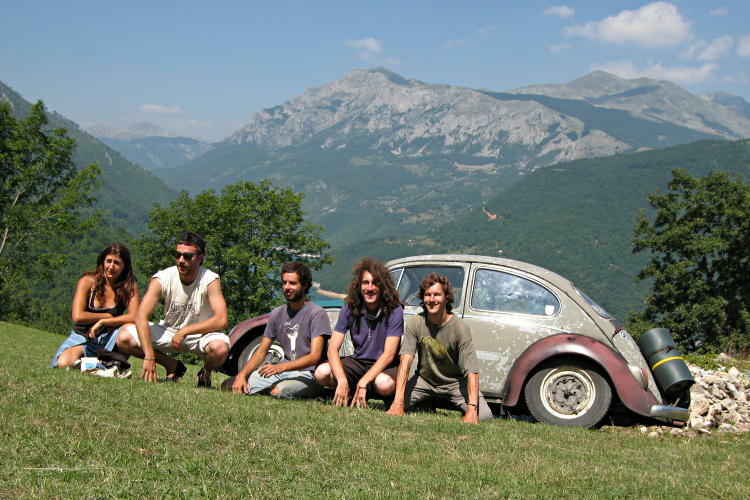 Gareth returned to Montenegro to pick up the Buba and continue towards Albania, Thibault and Maria took their own ways, while I and David headed to Eastern Serbia to the European Rainbow Gathering. During one week I got an introduction to life in Bosnian countryside by visiting a couple of villages and the ecological community Zelenkovac. Work on the fields was more modernized than for example in Romania, but far from large high tech farms in Western Europe. People had time, nearly everybody smoked cigarettes constantly and guests were received by offering them shots of homemade rakia, a strong alcohol usually made of plums. In Zagreb, Croatia, I took a train to Karlovac and started hitchhiking from there towards the Bosnian border. A man who built swimming pools for a living took me to the crossroads near Plitvice and a truck driver picked me up from there. It was my first ride ever in a large truck — cool to see the road from high up in the cabin. At the customs the truck had to stop and wait in line. I hopped off, crossed the border by foot and decided to walk to the first village, Izacic, and see what happens. Hasan was sitting on the terrace of his house and waved me to have a seat beside him and take break. Soon his English speaking son Adis arrived and it didn't take long until I had met some of his friends and been invited to stay overnight. In fact I ended up staying two nights. Life was slow, especially for the young people who were on holidays from school or university. They killed time sitting outside, smoking, sipping some coffee or beer, chatting and playing with their mobile phones. Inside they had TVs and Playstations but Internet was not common yet. Actually there was an Internet cafe in the village but the connection was broken. Nearest town was Bihac, where we had a picnic by the Una river. Quite a few people had friends or family members who were working in Austria or Germany. They came back in their home villages in the summer to hang around and show off their cars. From Izacic I moved on to Zelenkovac in central Bosnia. It's a community founded 25 years ago by a painter called Borislav Jankovic, more commonly known as Boro. He moved out of the nearby village to near some old water mills, built a house and started inviting people to visit while working on his paintings at the same time. Zelenkovac was a lovely place. A small river flowed in several parallel streams through a forest with wooden buildings scattered around. The water mills had stopped long ago but the funky and twisted main building was full of life, with both tourists and villagers coming and going, Boro and his son Alex welcoming the visitors and a few other regulars taking care of the bar. I stayed with some other guests on the second floor of the main building, which had a bunch of old beds and mattresses tucked in different corners of the oddly shaped open space. There was one more room still above the second floor, accessible by stairs outside in the open air like in a treehouse. 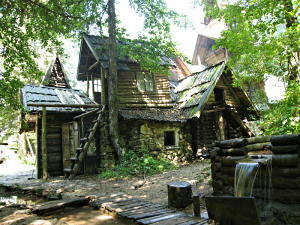 Zelenkovac advertised itself as an eco-village, although many typical features of ecologial communities, such as recycling, vegetarianism or environmental campaigning were missing. I saw it mainly as a place to be surrounded by beautiful nature, meet people and enjoy life. The eco aspect was to keep the area at least relatively untouched, live modestly and maintain an open-minded and friendly atmosphere, instead of destroying the site or turning it into a luxury holiday resort. However, Boro had wishes for enlargement and increased visibility. He was planning to organize international volunteer camps in Zelenkovac during summer 2009, which will hopefully succeed in developing the place further in a sustainable way. In Zelenkovac I met also David and Gareth, two Englishmen who had arrived a couple of days earlier in a 1966 Volkswagen Beetle, or VW Buba in Bosnian. Together with them and Alex we went to the nearby village to help Boro's brother to collect hay. The brother had hurt his hand falling off his tractor so he was happy to get some help. Rakia had probably something to do with the accident — we had already learned that rakia was the fuel for people just as diesel was for the tractor. We managed to collect one and a half small fields worth before a thunderstorm came and made all the rest wet again. Boro's brother didn't seem to worry too much, we just went inside his house for coffee and more rakia. Zelenkovac was a place I could have stayed in for weeks. However, Gareth was leaving towards the east and I decided to join him. David fetched two French friends from a town 40 km away. Then we packed the bags of all five of us and ourselves in the Buba and drove off towards Sarajevo.